Home/Forms by Trades/Cleaning Services, Res & Comm. This form is used to obtain and file new client information, where you can enter client's name, billing and job address, client's file number, contact numbers, etc. You can also record the cleaning days, preferred cleaning times and frequency, and other details such as security expected, property type, adults living in the home, pets and types of pets and names of pets, square footage area and additional notes. 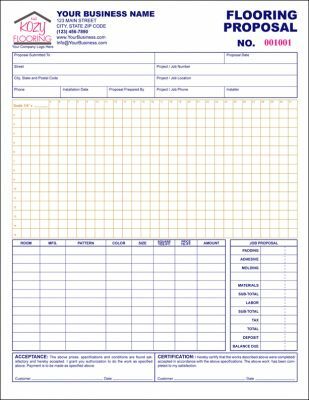 The fillable interactive PDF form comes ready to personalize and use, in 2 colors, pink / lavender and blue / lilac, as displayed in detailed image in the product description page and can be modified using free Adobe Reader, using our new Form Options Menu which allows you easily personalize the form with you business name, address and contact numbers, you can also enter your business logo and any other images you need, the form can be used on the field as a fillable form, or fill out by hand. The form for use with Microsoft Word is fully editable and includes 20 light colored backgrounds that you may use to color your form's background to match your business colors or use without a background. A fillable work order for cleaning service good for commercial, office, corporate and janitorial services. The forms contains room to record customer information, work details. Keep full records of Work to be done, materials and equipment used, labor and misc expenses and charges. 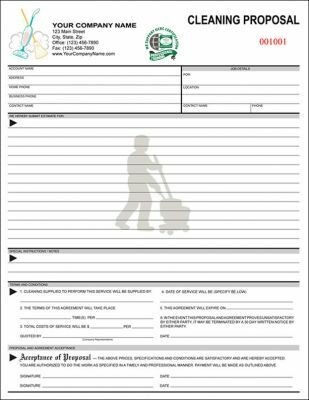 Space to add your own terms and conditions at bottom of form and authorized signature. The form also serves as a service and invoice form. The PDF form is fillable and self calculating. This is a very easy to use, fillable, residential, house cleaning service and work order and also serves as a billing invoice. 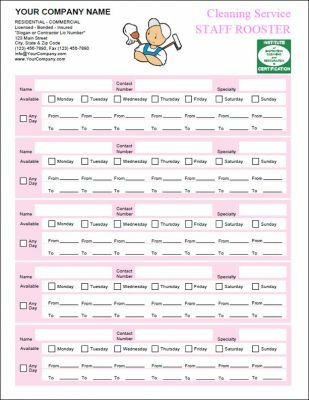 It contains tasks list with check boxes to keep track of cleaning duties performed and make write-ups fast and easy. It also has a section to record special cleaning instructions and special instructions. Easy to modify using Microsoft Word editing tools or use Adobe Reader to edit form's company name , form title, terms and conditions -and more using our new, Form Options Menu to customize your form. Itemized worked list can be easily edited, using your choice of, free Adobe Reader and Microsoft Word. This is a house/residential cleaning work order and also serves as an invoice. 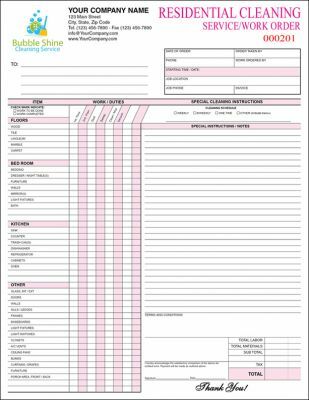 Cleaning work order contains duties work list with checkbox so cleaner can check mark work duties as work is performed, assures all duties are performed and enables quick write ups. Easily modify form using Microsoft Word or free Adobe Reader. Work list and heading titles may be fully edited and personalized using free Adobe Reader. Fully editable using Word. This is a house/residential cleaning service agreement and may also serve as a proposal. Has ample space for client billing and service address, space for cleaning details, covering: type of home, rooms to clean, frequency, preferred days, key release, etc. with areas for cleaning exclusions, products/brands requested by client, special areas of attention, special notes, plus much more, including payment methods, frequency of initial and other cleaning. 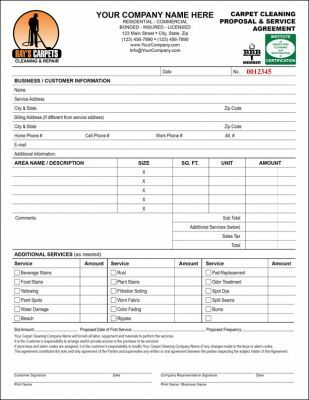 This is a multi-use carpet cleaning form that serves as a carpet cleaning job invoice, maintenance agreement and bid Proposal, includes sections for client, billing and service information, description or area to be cleaned by either in feet or sq. ft. with unit price and total amount columns. 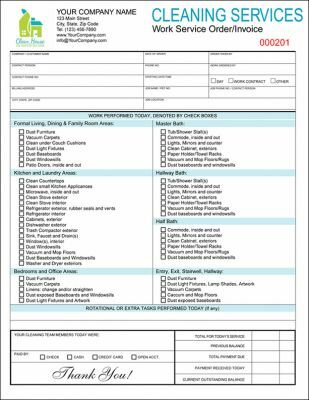 It also includes checkboxes to check off additional services provided such as beverage stains, worn fabric or odor treatment, these can be added to the total amount by specific charged amounts. With general terms and conditions at bottom of form with signature lines for customer and company or technician signature. 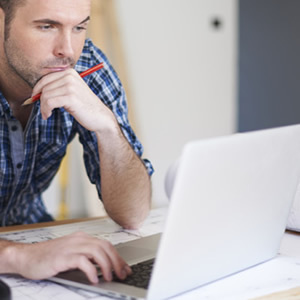 The flooring contractors proposal form was developed specially for floor laying firms and designed for keeping a full record of the details discussed between the contractor and the client. Easily record the potential customer's information and job or project information at the top of the form. The clear grid in top can be used to notd down or draw the details of the job and map them out for greater clarity. Details of rooms, pattern, color, size, square yardage, price per feet and amount can be clearly noted on proposal with job proposal summary to provide your customer with clear costs. Signature and industry standard terms and conditions are found at bottom of form. Available in two colors, blue and black, choose your preferred color at no extra charge. 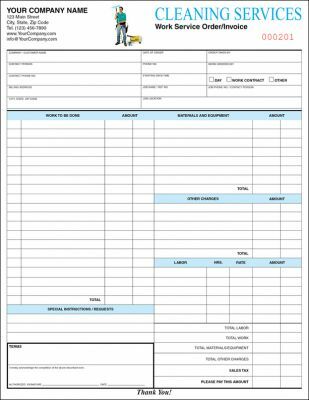 This form will save time and effort for every job and works perfect to keep things clear with the client. General, all purpose cleaning janitorial proposal form for all your proposal bidding needs. This cleaning Bid Proposal form is designed with plenty of room for describing in detail all points of a proposed service. At the bottom of this form we have included a 6 point check list where you could make certain all your bases for a proposal are covered, followed by an acceptance of proposal section with payment details and signature lines. Just for cleaning professionals serving. This is one impressive cleaning proposal, giving your company a very professional look. 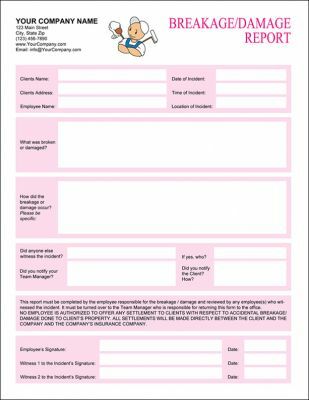 The proposal form can be used for home, office and commercial. The form follows check box styling which saves a lot of time and helps you cover all the important aspects of the task without error. Be it the service required or the frequency needed, these forms cover it all. With all the information included on one paper, data entry is simple and referencing becomes real easy too. 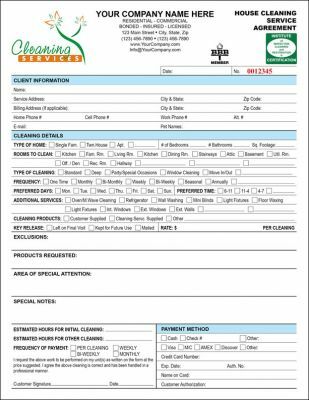 This form is used to report and record any broken or damaged item(s) that occurred during the cleaning service period. 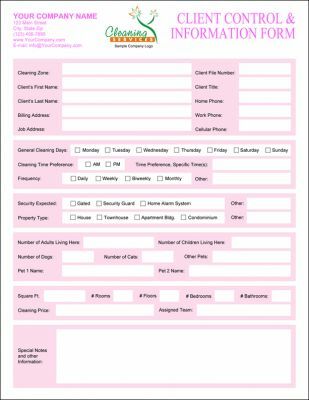 This is a fillable carpet cleaning work order and provides sections to record customer information and contact details, dates etc. The work order provides lines for item description, room size in feet, square footage in total and self calculating math form functions multiplies total sq. ft by what you charge per unit, providing the sum in the total column. With so many lines, you have ample room to enter very a very detailed work order or you can use the additional lines for other work, such as fabric cleaning or odor treatment services. With general terms and conditions at bottom of form with signature lines for customer's satisfactory acknowledgement and company or technician's signature. Interactive PDF form is self calculating, adjusting for areas to be cleaned, additional services added or removed, sales tax -if required. 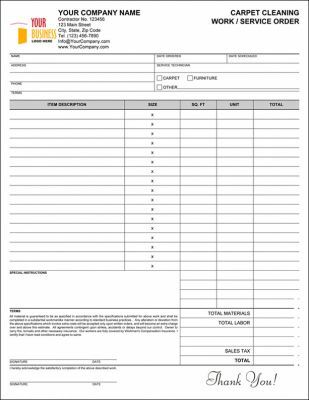 This fillable form comes for use with free Adobe Reader and Microsoft Word. The PDF eForm is self calculating and you may enter your own company information and other details, your business logo and or any other business images as you may need, using our new, Form Options Menu to customize your form.